VARIDESK is office furniture made simple. 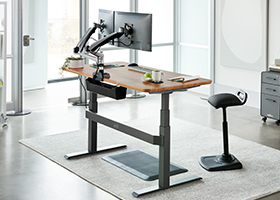 Our height-adjustable standing-desk solution was the first step to promoting a happier, healthier, and more productive workspace. 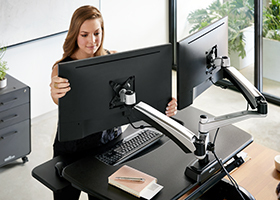 Today, VARIDESK has a full line of furniture and accessories for the office and the classroom that are easy to order, assemble, and rearrange. VARIDESK has shipped products to over 120 countries and is improving the way people work in 98% of Fortune 500 companies and 96% of federal government departments. 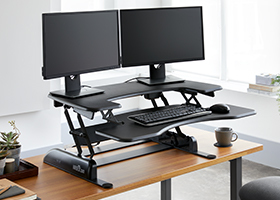 Our best-selling model turns any desk into a standing desk, featuring a sturdy two-tier design with an upper display surface and lower keyboard deck. Place your displays at a comfortable viewing height, freeing up some desk space to create a more productive workspace. Change the way you work, creating a happier and healthier workspace, with the touch of a button.